Crafters, Halloween is here! Our season has arrived! It’s time to show off that Pinterest-know-how, grab some fabric and decorate to your heart’s content. 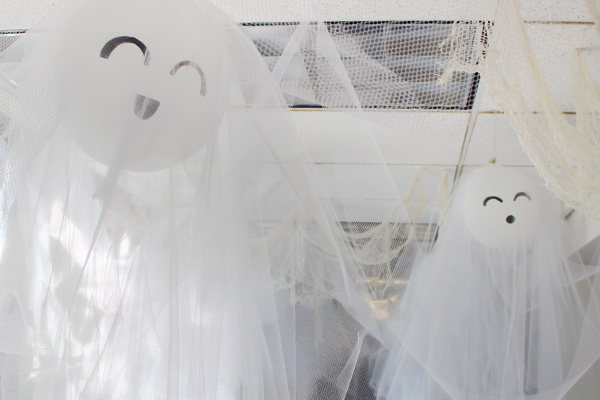 If you want to share your Halloween-happy spirit with the world, this easy floating ghost decoration is sure to do the trick. 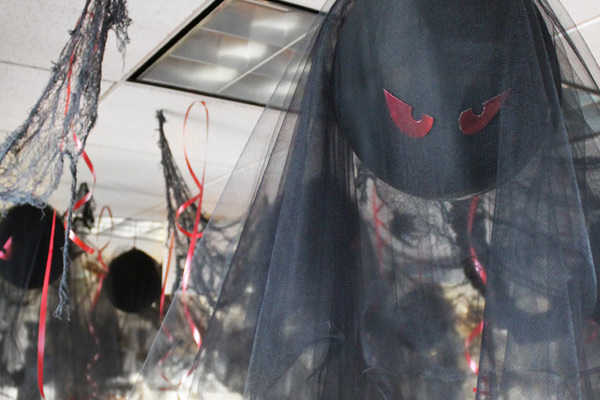 It’s quick and easy to make, spook-tacularly stunning, and can be used for parties, the office, and seasonal home decor. Here, we’ve crafted friendly ghosts and grumpy ghouls. Let us show you how! First, help your ghost float! Take your balloon, inflate to its maximum diameter, and tie balloon end securely. Next, add some personality with an expressive face. Keeping balloon end upward, we wanted these ghosts to be friendly and fun, so we drew smiles onto their faces. Prep your wispy tulle dressing. Take your bolt of tulle and roughly trim 3 wide rectangles. Layer these rectangles on top of each other and trim a hole in the center. Dress your ghoul! Layer each rectangle over the balloon end, letting the fabric fall naturally. Weave end through tulle hole. Finally, let your ghost fly. Tie balloon end with curling ribbon and display. First, give your ghoul a body. Take your balloon, inflate to its maximum diameter, and tie balloon end securely. Don’t forget to make it menace! Using our poster board, we cut out expressive eyes and taped them onto our balloon body. To ensure a rounded bottom, we kept the balloon end upward. Prep your dark tulle dressing. Take your bolt of tulle and roughly trim 3 wide rectangles. Layer these rectangles on top of each other and trim a hole in the center. Dress your ghoul! Layer each rectangle over the balloon end, letting the fabric fall naturally. Weave balloon end through tulle hole. What types of Halloween crafts are you making? Don’t hesitate to show us using our #mypapermart tag. We are continually inspired by you and your creations! Did you love this simple how-to? Stay tuned for more. We’re looking forward to helping you upgrade your decorations this holiday season with more DIY craft videos, product features, and tips for small businesses.